We have the same favorite! I’ll not drink tea if it’s not Lapsang Souchong. We are a very exclusive club !!!! Good to connect with a fellow addict. Hello Lynne, so good to hear from you… you’ve got it – the ritual is as good – almost – as the taste – and the ultimate human happiness !!! This is a timely reminder to me as I sit in a cafe being revved up by the American alternative to tea: coffee, the louder brasher drug of choice for the fast lane! I must try that twinings… tomorrow! And there’s a nice floral teapot at the kaiwaka st John’s. .. Maybe I will buy it! So you see, you are changing lives! Great to know that my little bit of fun is life-changing! I actually love coffee – at the right time – morning or evening, but never in the afternoon, and Never for early morning tea!!! I should go for the floral teapot before anyone else snaps it up !!! I think that I should give more thought to drinking tea! My good friend in Canada is always stopping for tea! I always loved the thought: “tea and crumpets!” I live in Wisconsin and my sister has every kind of flavored tea that exists! I just like “simple tea” with a dash of lemon and, of course, sugar! Stopping for tea! that sounds a familiar phrase ! or the tea-break… do we say coffee break, or hot chocolate break !!!! Tea and crumpets sounds perfect for a cold winter’s day… tea and cucumber sandwiches on a hot summer’s day ! Isn’t it easy to get carried away with tea!!! Can’t live without my Earl Grey of herbal peach! Valerie,I could not agree with you more about how essential tea is! I am more of an Earl Grey girl myself, but have never tried milk first, although now I plan to do so. Thanks for the tip and the lovely read. What a delightful post about the pleasures of tea drinking. I now make green tea in a precise way, timing it for 3 minutes with my egg timer . . . I remember discovering Twinings when living in England – and Earl Grey. There’s a shop called Tea Total in Mt Eden which sells deliciously fragrant blends. Oh yes, tea! Love it! My taste differs a little bit from yours (Fairtrade or Yorkshire Tea teabags in a pot or mug; milk in first *only* if the tea has already been brewed and the teabag removed) but the bottom line is, I drink tea like an Englishwoman. Which I am. When in the States or Canada, I’ve been asked whether I’m ill in response to my request for tea. Then I’ve been offered a selection of herbal ‘teas’ and another selection of flavoured (flavored) ‘black teas’. None of which is a proper cuppa. The lack of proper tea is one of the reasons I don’t like going abroad. Even within Britain, I sometimes pack teabags just in case there are none available. I’ve racked my brains as to which stately home on the Thames you’re referring to… Ham House, Orleans House, York House??? How fascinating… Elizabeth Twining’s House, Dial House is just across the river, where my in-laws lived over fifty years ago! In those days there was a ferry across to Ham House – actually a rowing boat – that had been there since the middle Ages. The family still lived in Ham House back then – and they were a rum lot! I can imagine! The National Trust took it over in 1948, I think. I would have loved to see it when it was still being lived in! Well, Sandie, making a pot of tea gives idle hands something to do !!!!! First of all, I love the teapot in your photo. Second, whatever the tea, I must drink it from fine bone china. Sometimes I am a milk first person and sometimes not. On my kitchen wall I have a poster which reads “Unable to make a decision, Cecily made a cup of tea instead” and that sums up my life, and attitude to tea, completely 🙂 Enjoyed your post immensely. You may enjoy this article http://www.guardian.co.uk/lifeandstyle/2010/jan/31/tea-drink-alexander-mccall-smith in which one of my favourite teas is mentioned; Bush Tea. I am very addicted to that. I LOve those Cecily tea cloths – I have one in my gift drawer waiting to go to the right person… actually a painter friend , which reads ‘ Cecily endeavoured to look knowingly at the painting’.. I read Alexander McCall- Smith immediately – typical of him and delightful on so many levels, thank you so much for pointing me in his direction… lovely man.. ! My mother showed me that article by McCall Smith when it first came out and your post reminded me of it. I am glad we are both fans of Cecily! In somepart of China, when you go for a meal in a restaurant, you will be asked “what kind of the tea would you like to drink” before anything else. I can understand that !!! some of us think ‘China tea’ is the only tea to drink! I gather you are very proud to call yourself a tea snob 😀 – I think that the milk in first was originally done to protect the porcelain from producing those smaller than hairline cracklings rather than for the actual taste. Now of course I will have to try to taste the difference. Off grocery shopping today and I will be sure to buy some Twining’s Lapsang Souchong as I have yet to try it (for shame, for shame). Well I hadn’t thought of myself as a tea snob – just discriminating !!!! How interesting that that was the origin of MIF… because only those with means would have the porcelain to drink from…. I’d forgotten about the genteel pinky !! you did make me laugh!!! And no dipping biscuits in the tea either!!! no more tea dust for me–I feel fully informed after reading this! Well really Lou-Ann, I think we only scratched the surface of the tea addiction! And did you taste the dry cleaning fluid that it smells like… think that’s why it is instant coffee. something to do with the process!!! Yes, our little rituals matter don’t they ! I hadn’t thought of applying the same principle to coffee – but it makes sense, and I’ll have a go tomorrow at breakfast! South African red tea…. I’m learning so much about tea from everyone’s comments!!! Brilliant quotation and one of my favourite cakes with my Granny’s way of calculating the weights – so easy to make more or less, sometimes with just one egg for just a few cup cakes to have with that wonderful cup of tea, Lady Grey is my favourite at the moment but I like a good (not strong) cup of Yorkshire tea first thing in the morning, always MIF! What a great idea to make a small amount with one egg and the rest – I’d never thought of it. I’ve never heard of Yorkshire tea, though I lived there as a child. Another blogger mentioned it too… what is it? Yes, President Jose Mujica is one in a million, still using his ancient VW and living on his run-down farm instead of spending pointless millions on pomp and circumstance… Lovely to have your comments…. I shall think of you when I fill the next pot, and may yours be as comforting as mine ! Love your beautiful tea pot, Valerie! 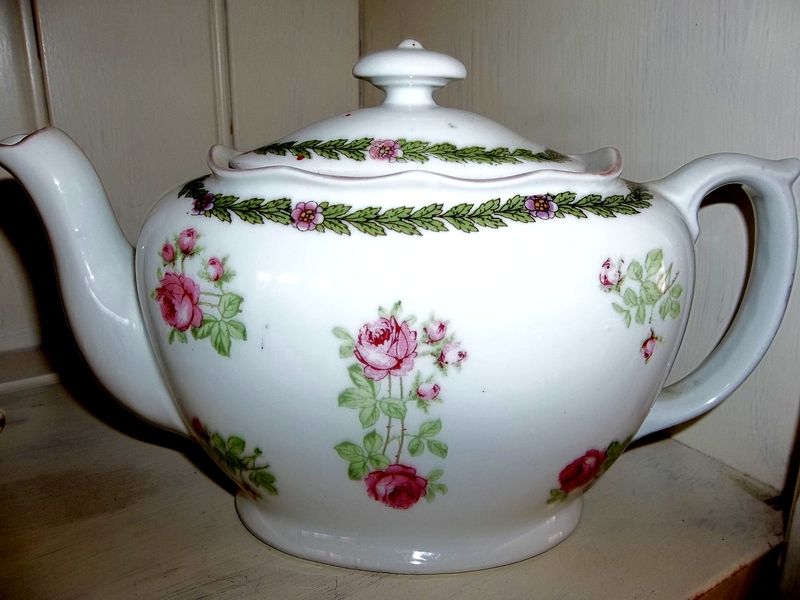 Hello Amy – the pot was a present from a very special person, and there’s a story behind it… and I would love to make you a cup of tea in it !!! It would be no trouble !!!! Hello Kathie, after hearing from all the other tea-drinkers I can see that there may be more to life than Lapsang Souchong! Hope you find a tea you like to light up your days!!! Hello Celi, Yes, I’d forgotten the tea stand.. I still have a china one, black with gold decoration. I use it to stand potted plants on ! Yes, my stepmother was a fanatical butter dish and butter knife person, and every jam and marmalade had to be decanted into a glass dish with a spoon.. And talking of decanters – glad to hear you are mending your ways with the port !!!!. Lovely that you had time to read this blog, and glad you enjoyed it… . Valerie, you are the 3rd person in the past month who has mentioned lapsang souchong, so on your recommendation, I am going to buy some and try it. The tea I buy is very disappointing, but then I usually use . . . tea bags. I’ve become too lazy. You have inspired me to take more care of my daily rituals. Sounds like synchronicity – you’re obviously meant to be drinking lapsang! I do hope Twinings decide to give me a commission for all these new lapsang souchong fans !!! I love that tea! I also enjoy almost all BLACK teas, not a fan of green or white but yummm Lapsan Souchong…perfect! As always Valerie you cheer me. Being a Texan (you will shudder) I only know one kind of tea, Texas Sweet Tea. I was raised on it, boiled with simple syrup until it was nearly as dark as coffee. I am not a huge fan, but now and then it suits. My choice? Coffee, always coffee. Dark rich coffee. MIF (cream actually and preferably Italian Sweet if I can find it). Coffee made with a bit of Chicory. Always coffee. From morning to the minute I close my eyes. Hello Val… Texas Sweet Tea… no, like so many other names in people’ comments, I hadn’t heard of that – boy am I on a steep learning curve about tea!!! Well, you make coffee sound poetic…I love it too, but only in the morning and evening … and the last drink at night ? Lapsang of course!!! I’ve tried MIF with my coffee today, and as you say, it’s good !!! You are so right, we all have our own tea rituals – it’s part of the joy of drinking tea, isn’t it? I agree, tea tastes so much better in a porcelain cup (many years ago I dated a Chinese man who scoffed at this and insisted tea had to be drunk in small – read ‘tiny’- clay-like cups, I never quite got used to this method….). I think I will have a cup of tea now, Darjeeling, no milk, no sugar. Good to hear from you Letizia… hope you enjoyed your nice Darjeeling, in a porcelain cup of course…so many different makes of tea I’m learning about ! At least i’ve heard of Darjeeling !!! There is something about the rituals of tea that give a sense of connection and security. Whenever there was a celebration, we would have tea. Whenever there was a crisis, we would have tea. Whenever there was a good book to read, the tea would be ever close by. I drink tea without milk or sugar, but I am fascinated by the different ways to take tea. I have several books on the history of tea, but the one I enjoyed the most was “For All the Tea in China” by Sarah Rose. It tells about the adventures of Robert Fortune (of Key Garden fame) – I know that you would absolutely love reading the book. I was able to get a audio-book at the Vancouver Public Library. It reads like a spy thriller. Here is a short 1 minute overview. definitely a must to read… am off to the village bookshop to order it after the weekend. A little honey in mine, please and oh yes…I nominated you for the Versatile Blogger Award! I wouldn’t expect you to drink anything else!! !